The Sony Alpha A300 and A350 are well designed digital SLR cameras that provide a wealth of photographic options. The Sony Alpha DSLR-A300/A350 Digital Field Guide strips away the mystery from the menus, buttons and dials to allow the user to master the art of taking great pictures with the A300 series. The reviews are in! Check 'em out. 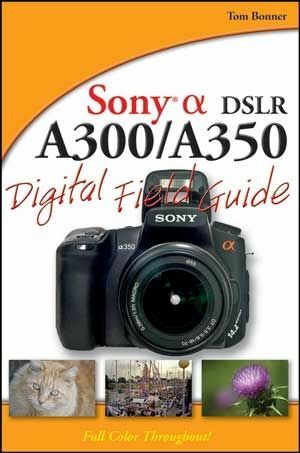 Purchase the Sony Alpha DSLR-A300/A350 Digital Field Guide on Amazon! Get the most from your A300 or A350. Order the Sony Alpha DSLR-A300/A350 Digital Field Guide from Amazon. If you want to improve your Sony Alpha A300 or A350 experience, this is the place to start. Chapter one gets right to the heart of the matter with an in depth look at the Sony Quick AF Live View System, which sets the A300 and A350 apart from the other dSLRs in he Alpha lineup. The chapter then looks at all the external controls on the A300 series, exploring each button, dial and switch. After completing this chapter, you will be completely familiar with the controls on the A300 series. Chapter 2 begins where the first chapter left off, dissecting each setting available in the A300 series menus. Understanding the menu system is crucial to getting great results with the A300 and A350, and Chapter 2 gives the reader an easy-to-understand discussion of each command and explains the circumstances where the command should be used. The Sony Alpha A300 and A350 appeal to a diverse population of photographers, some of who have been shooting for years, and others who are entering the word of the dSLR for the very first time. Chapter 3 gives the reader a through explanation of basic photography fundamentals, without overwhelming the reader with jargon and technical terms. New photographers will gain an appreciation of aperture, shutter speed, exposure, ISO and white balance. 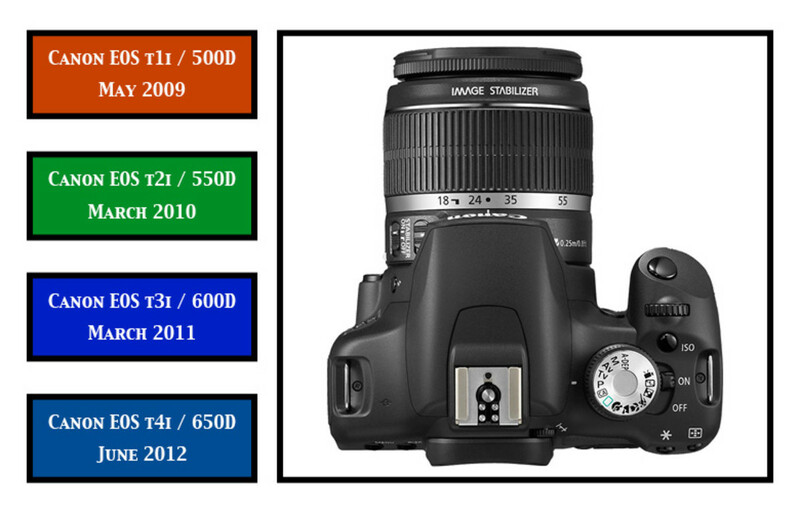 This knowledge will help the first time dSLR shooter rapidly advance in their quest to become a better photographer. The chapter serves as a refresher course for long time dSLR users and also helps in the transition from film to digital SLR shooting. Both newcomers and experienced shooters will benefit from the section on composition fundamentals. Interchangeable lenses are one of a dSLR's major strengths, and that is true of both the A300 and A350. With so many lens options, choosing auxiliary lenses for the A300 series can become overwhelming. Chapter 4 helps eliminate the mystery about which lenses to buy and gives you a full explanation of what to look for when evaluating a new lens. The chapter takes a close look at wide-angle, normal, telephoto and macro lenses. It discusses the full Sony lens lineup and goes on to demystify the option of using Minolta lenses on the Sony Alpha. You'll also learn what to look for when buying a used lens. The chapter closes with a look at must-have accessories for the A300 series, including the vertical grip, remote releases and more. Understanding light and light modifiers is absolutely essential to getting great results from a dSLR. in chapter 5, you'll find a complete discussion of lighting basics, including the differences between continuous lighting and electronic flash. The full array of light modifiers is outlined, and the chapter goes on to explain the strengths and weaknesses of the proprietary Sony/Minolta hot shoe design. Naturally, there is also a discussion of which flash units work with the A300 series. When you complete Chapter 6, you will be well equipped to handle almost any photographic situation you encounter with your A300 series. 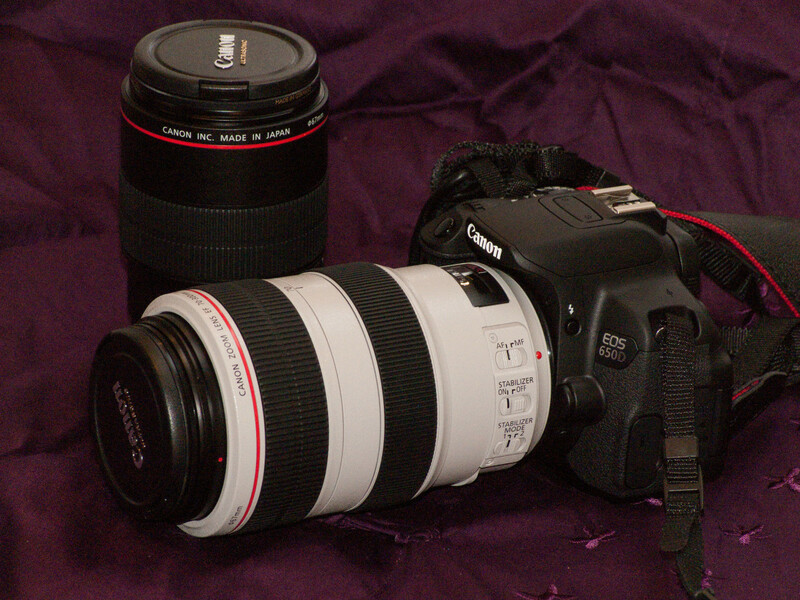 DSLR photography entails far more than just the camera and lens. Once you fill your memory card with great images, you will need to catalog, store and edit those images. Chapter 7 takes you through a quick, but informative tour of the software and hardware options available to simplify your digital workflow. You will be exposed to the differences between RAW and JPEG images, and you'll receive a through overview of your RAW processing options. You also learn about sharpening and noise reduction software, as well as the best pixel editing applications. Sony Alpha DSLR-A300/A350 Digital Field Guide is available online and at fine book sellers across the USA - Brand new -- just in time for Christmas! You should be able to find it at most brick and mortar bookstores as well. Should You Buy a Used Lens? When Konica-Minolta announced that they were exiting the camera business, Tom Bonner realized he had to make a decision. A Minolta user for decades, Bonner was suddenly looking at a photo landscape devoid of future Minolta offerings. Electronics giant Sony announced they were acquiring all the photographic assets of Konica-Minolta, and Bonner faced the choice of switching brands or staying the course with newcomer Sony. That was in 2006. Since then, Bonner made the decision to move into the Sony camp, started a popular blog about Sony Alpha cameras and has just completed a book about the Sony A300 and A350 dSLRs. "It's been an interesting couple of years," Bonner smiles. "I was somewhat concerned about whether Sony would maintain the quality and innovation that the Minolta cameras offered. Today, I am very happy with the direction Sony has taken with their Alpha dSLRs. The cameras are great; they are easy to use, reliable and they make great images." Bonner began his photographic career in the mid-seventies. Covering motorsports and the Detroit auto industry, Bonner's photos began to appear in national magazines throughout the country. He traveled extensively on assignment, creating images of cars, events, travel locations and outdoor subjects. In the nineties, Bonner entered the graphic arts industry, spending a decade working at the Detroit office of Applied Graphics Technologies. There he was involved in all phases of high-end advertising graphics. He worked closely with many of the top art directors in Detroit, learning how to produce the highest quality print material. Much of the work consisted of retouching images in Adobe Photoshop. "The Detroit agencies take their advertising images very seriously," Bonner attests. "The art directors were great to work with, but when it came to their images they were incredibly demanding. You were expected to turn out flawless work under the tightest of deadlines. It was hard work, but thanks to that period I can cut Photoshop masks in my sleep." The new millennium found Bonner behind the lens once again, this time photographing million-dollar beach homes along the North Carolina coast. The images were designed to be used on the Internet, and Bonner began to leverage the skills he learned in the prepress industry toward designing high quality websites. He quickly masted the intricacies of CSS, Javascipt, Flash and advanced HTML. Of course his Photoshop skills fitted perfectly into this new scenario, as did his photographic experience. He continued to shoot film, but he started to incorporate digital cameras into his repertoire. With his extensive digital experience at AGT, working with multimedia formats was second nature to him. With Minolta out of the picture, Bonner determined to start writing about the new Sony Alpha. He started a blog for Sony and Minolta SLR users at alphatracks.com. Alphatracks covers both film and digital pursuits. Digital topics, however, are becoming much more prevalent. "I still love my old Minolta film SLRs, but that train has left the station," Bonner explains. "I am excited about shooting digital. I love the immediacy of seeing what you shot and the ability to tailor the ISO to the shooting conditions. I've found that my experience with my old manual film SLRs translates very well to the Alpha dSLR cameras." In 2008 Bonner accepted an offer from Wiley Publishing to write the Sony Alpha DSLR-A300/A350 Digital Field Guide. "This was a wonderful experience," Bonner says. "The people at Wiley were great to work with, and I really enjoyed shooting with the A350. I worked very hard to make the features and settings of the A300 series easy to understand by dSLR newcomers, while at the same time including material useful to more seasoned photographers." The book is part of the Wiley Digital Field Guide series. Each book in the series focuses on a particular digital camera, exploring the menus and controls in detail. 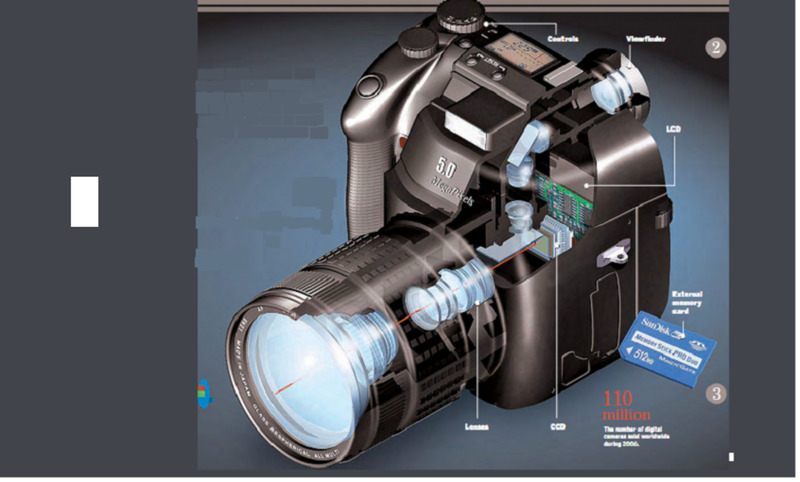 In addition, each guide provides information on lenses, flash units and accessories. There are also sections on photographic workflows, troubleshooting and resources. "My favorite part was developing the photography exercises section," Bonner says. "The idea of this section is to provide exercises that users of all skill levels can follow to improve their photographic techniques. The section runs the gamut from sports-action photography, to travel, to portraiture, to black & white photography. Hopefully, readers will learn some new techniques to enhance their images under specific conditions." Now that the book is completed, Bonner has returned to blogging at Alphatracks, as well providing event photography and web design to corporate clients. Tell us what you like and dislike about the A300 series. What are the strong points? What could Sony have done better? Would you recommend the camera to someone else? 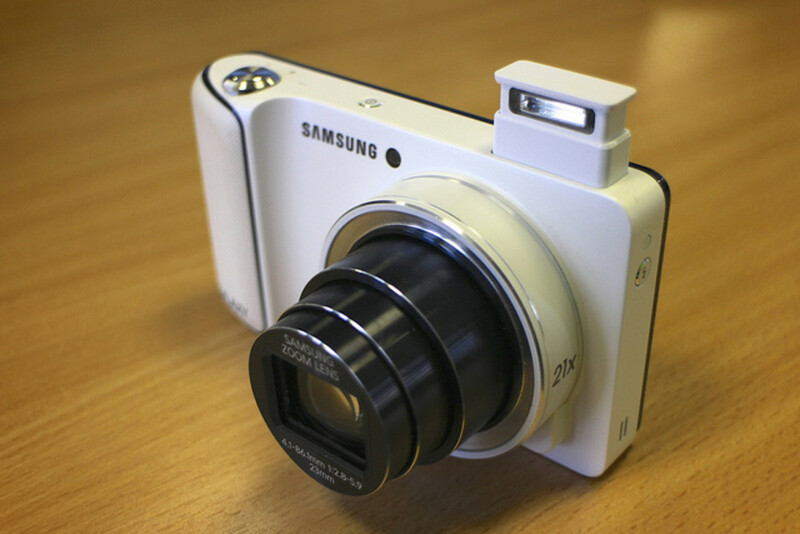 I would love to get this camera!